Automobile accidents in Elliot Lake, as in the rest of Canada, very often produce traumatic brain injuries that are not immediately apparent. The severity of brain injuries that occur as a result of motor vehicle accidents range from minor to traumatic. Even a minor brain injury, initially classified as a concussion, can lead to long-term permanent disability and neurological diseases such as Alzheimer and Parkinson's disease. A concussion could present few, if any, outward signs to indicate that you have been severely injured. If you have a loved one who has been involved in a motor vehicle accident, there are signs you should look for that would indicate that a person has been the victim of a concussion. Consider consulting with one of our Elliot Lake personal injury (ILO) lawyers to determine if you have a viable claim and to direct you to proper health professionals to determine the severity of injuries. Do not assume that if you are not bleeding and have no broken bones, you were not seriously injured by the automobile accident. The debilitating symptoms of a concussion can take months or years to manifest themselves. Therefore in almost all instances, if you have been in an auto accident, you should seek a neurological examination by a licensed physician. The web site, healthline.com, has published a list of symptoms that one should look for that indicates, whether or not one has had a concussion. These symptoms may be present immediately or they could occur weeks or months after the accident. The signs to look for are unconsciousness, memory loss, dizziness and blurred vision. Being unconscious is similar to being asleep and unable to wake. When a person is unconscious, they are generally unresponsive to verbal or physical stimulation. If a person at the scene of the accident is unconscious, chances are they have suffered a blow or a jarring of the head and have suffered a concussion. Most times, unconsciousness occurs at the time of the motor vehicle accident and can be treated by paramedics at the scene. If unconsciousness occurs days, weeks or months after the accident, it is a sure sign that more serious neurological damage has occurred. Someone who has been involved in a collision could be semi-conscious and still be suffering the effects of a concussion. All one has to do is look into their eyes to see that unfocused, distant, glassy-eyed stare to know that something isn't right. Nine times out of ten, the person has experienced a concussion and needs immediate medical attention. A person doesn't have to be knocked out cold to have had a serious brain injury. Memory loss is a good indicator of having had a brain injury. For example, when a boxer is knocked down and gets back up, the referee asks the boxer his name and what round it is. If the boxer can't answer these simple questions, the referee is instructed to stop the fight. In an automobile accident, one's head often strikes the steering wheel, dashboard, rooftop of the car, or is struck by the deployment of an airbag. Any of these events can render a person unconscious, resulting in memory loss. As with the example of the boxing referee, a paramedic is trained to ask simple questions such as, what is your name and where were you going, to someone injured in an accident and suspected of having a concussion. The signs of having suffered a concussion can present themselves days, weeks or even months after having had a motor vehicle accident, and dizziness is a frequent symptom. Dizziness can occur when you sit up in bed in the morning, or when you bend over to tie your shoes. Dizziness can also happen when you are simply sitting still and trying to focus or concentrate. While not all dizziness is a sign of a concussion, if you are experiencing it shortly after having had an auto accident, you should seek medical attention. Blurred vision is a noticeable change in your eyesight. If after an accident, you experience difficulty reading or seeing the TV from your usual viewing position, you may be suffering from a concussion. It's not enough just to go to an ophthalmologist to get your "eyes checked". If your blurred vision starts within a few months of your motor vehicle accident, you should seek the attention of a neurological specialist. A neurologist is specifically trained to look for the signals that a brain injury has occurred and can recommend a program of treatment to help you get your life back to normal and your eyesight restored. There is nothing we take more for granted than our ability to stand and balance.Howeverif you have experienced a concussion, your ability to balance can be compromised. If you find that you frequently have to catch yourself from falling, or are tripping more than normal when you walk, you may be suffering from the after-effects of a concussion. The side effects of having had a concussion can last for years and negatively affect your ability to work and earn a living. It doesn't matter if your work is primarily mental or physical in nature; the mental and motor skills you need to perform your job can be negatively affected by having had a concussion. If you have suffered a blow to the head or body, or have fallen or been in a violent collision, chances are your brain has been jarred within your skull. There are many ways in which a concussion can occur, such as the result of automobile accidents, playing sports, or fighting. The most frequent type of concussion comes from being involved in an automobile or any motor vehicle accident. Given the speed at which you are traveling and the speed at which another vehicle is traveling, it is almost impossible to prevent your head from striking something. In the case of the deployment of an air bag, automobile manufacturers are willing to sacrifice the potential for a concussion caused by the airbag, if it increases the odds that you will not suffer more severe injuries that a collision can cause. Every play in football, from the junior leagues to professional football, involves two or more players colliding as violently as possible with each other. Hockey and rugby have a similarly high potential for head injuries. While helmets prevent cuts, bumps and bruises on the head, they do little to prevent the brain from rattling around inside of the head. Critics suggest that helmets may do more harm than good, as they encourage a player to strike another with greater force, thus increasing the potential for a concussion. Fighting is one of a few activities where the objective is to give the other person a concussion. There is no fighter alive who after a long career in the ring, does not suffer the obvious outward effects of having multiple concussions, including slurred speech, memory loss and confusion. Even the act of day to day training produces concussions for a fighter. There is a tendency for individuals involved in a motor vehicle accident to play down the severity of their injuries if there are no lacerations or obvious broken bones. People are relieved and want to say that they are fine, but more times than not, that is not the case. Brain injuries can be obvious but more often are subtle and require an educated eye to diagnose. More brain injuries occur as a result of one being involved in a motor vehicle accident than due to any other activity. Of all motor vehicle injuries, concussion brain injury is the most frequent. A concussion resulting from a motor vehicle accident or any other activity, is frequently the cause of a person having to take time from work due to temporary or permanent disability. 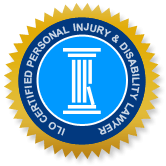 Accident victims need a personal injury lawyer who understands this, and who also has experience in all aspects of brain injury compensation. The Elliott Lake Injury Lawyers of Ontario (ILO) law team provide zealous legal representation and ensure that your neurological problems stemming from a motor vehicle accident or any collision are treated with the utmost seriousness. While cuts and broken bones heal over time, brain injuries can become more disabilitating and progressive. Our lawyers understand this and are here to help you.